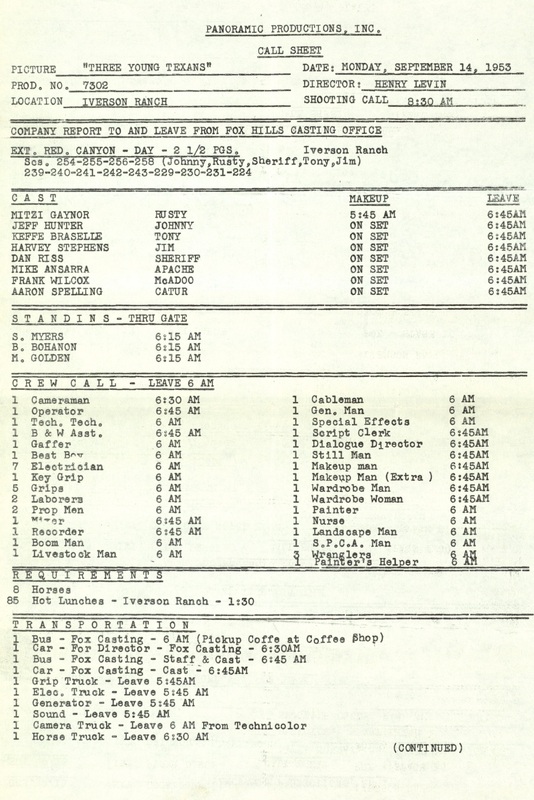 This call sheet for Three Young Texans indicates resources necessary for a day of filming at California’s famed Iverson Movie Ranch—including three wranglers, eight horses and eighty-five hot lunches. The Texas Collection maintains more than a half dozen screenplays either written by Texans or set in Texas. Many of these screenplays were used in the production of Western films, and from them we can get a good idea of the archetypal Texan. Generations of Americans were fascinated by the “Wild West”—how did they perceive the inhabitants of the Lone Star State when watching Westerns of the 1950s and 1960s? 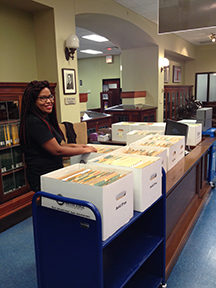 This month we are featuring two students that worked at The Texas Collection over the summer. Check out the collections they worked with while they were here! While scholars of pedagogy speak of “flipping the classroom,” I feel that my work at The Texas Collection has been an exercise in “flipping the archives.” By this I mean that as a historian I have long been accustomed to working with archival materials that others have preserved and organized, but now I have preserved and organized materials for others to use. Julia and Finlay Graham with son James. 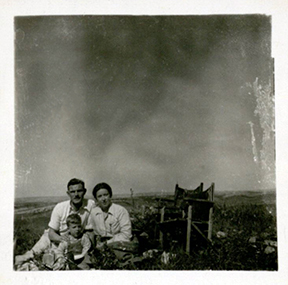 You’ll find this photograph in Julia and Finlay Graham papers #4003, box 38, folder 7, at The Texas Collection, Baylor University. Rights: Some rights reserved. E-mail txcoll@baylor.edu for information about the use of our images. 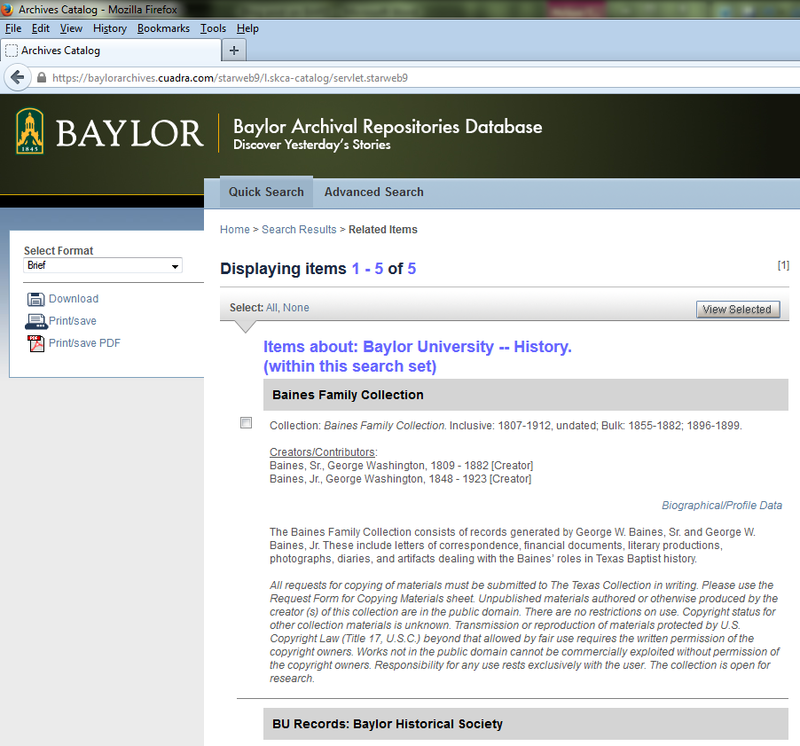 Visit www.baylor.edu/lib/texas/ for more information about our collections. Instead of letting me get my feet wet with a small collection, the processing archivist, Paul Fisher, began my internship with a metaphorical cannonball into the 72 document boxes of the Julia and Finlay Graham papers. Hailing from Texas and Scotland, respectively, Julia and Finlay Graham met in post-World World II Palestine and served in the Middle East as Southern Baptist missionaries for the next forty years. Though most of the collection documents their teaching and evangelistic ministries, their papers also contain glimpses into the politics of the Middle East, as the Grahams witnessed events such as the 1948 Arab-Israeli War and the Lebanese Civil War. After removing hundreds of duplicate pages, I reduced the 72 box leviathan to 50 boxes and a finding aid. 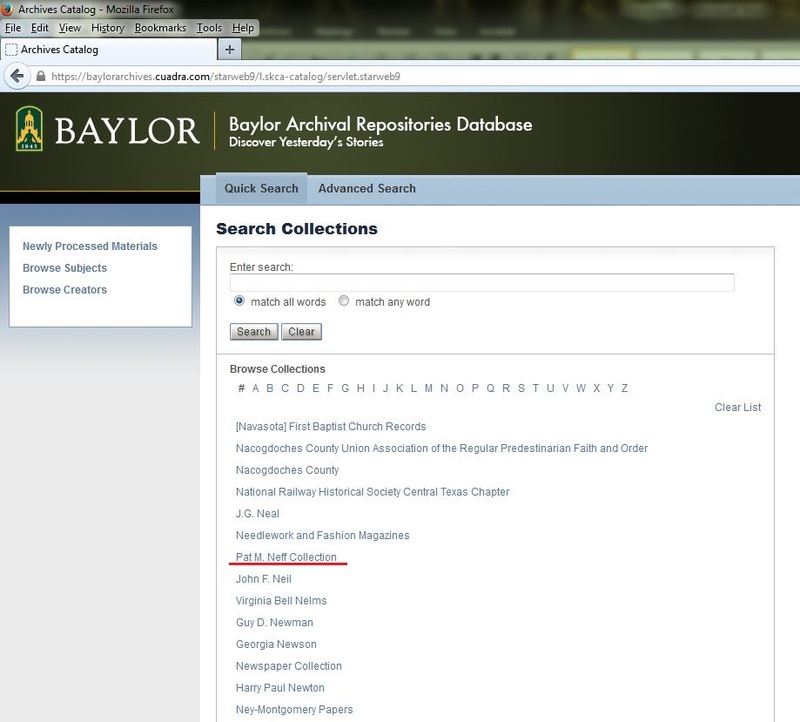 Closer to home, I also processed and created a finding aid for the records of the Waco Regional Baptist Association. Founded in 1860, the association remains a vital institution for Baptists in central Texas. I was particularly interested in the association’s records from the 1950s through the early 1970s, which provide a wealth of information on race and religion in central Texas in the era of the Civil Rights movement. The historian in me constantly envisioned how these collections could contribute to studies of the modern Middle East, twentieth-century Baptist missions, the Civil Rights movement, and a myriad of other topics. Although these studies will have to be written by other scholars, I hope that I have made their jobs easier through my work over the summer. Valencia Johnson, Museum Studies graduate student, at The Texas Collection. For an aspiring archivist with my disposition and imagination, spending time with papers is ideal. At a certain point in processing archival documents, the collection becomes a real entity; life reenters the boxes, and a complex picture emerges. This reanimation is what I learned in my time at the Texas Collection working on the W.R. White papers. His world, voice, and experience had been locked away for decades, and now they are tangible again. The collection has been a joy and a challenge. I processed a small four box collection for The Texas Collection in the spring, but W.R. White’s collection held 226 boxes—I had entered the big leagues. Undertaking such a vast and diverse collection has deepened my knowledge and appreciation of archival work. In our previous BARD posts, we’ve been exploring how to make the most of our new database in various ways. 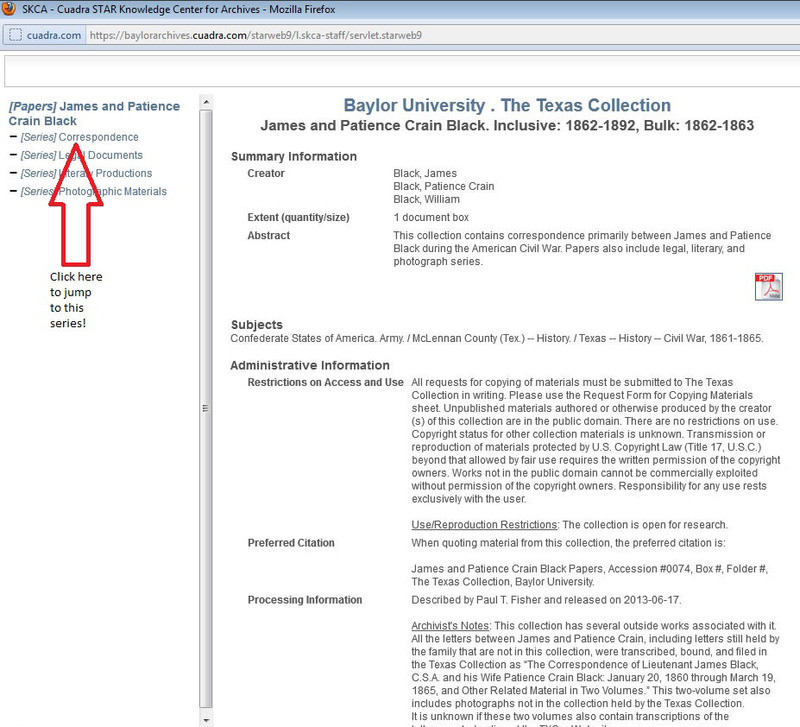 In our last post in this series, we offer a few more ways to discover Texas Collection resources: tips on browsing larger collections, using BARD’s advanced search, and opening attachments to collections. You can enter the BARD system by clicking the link on our home page. We have already learned how to search by keyword, but maybe you already know the title of the collection you want to see and just need to know which boxes to request. For example, you might want to look at Pat Neff’s finding aid. You could enter “Pat Neff” into the search field like we did before, or you could click on the blue “N” for “Neff” under “Browse Collections.” If the collection features a person, then it will be filed under their last name in the system. As you can see below, clicking these letters can bring up a lot of collections! The Neff collection is in the center of the page. Once you have found the collection you want, click the title to bring up the finding aid. The Neff collection finding aid is different from some others because it is so big. For example, on the left, there are blue + signs to the left of the series titles. In the first blog post in this series, we discovered that by clicking on the series titles, we could bring up just that part of the collection. In the Neff collection, you can click on the blue + symbols to expand your viewing options within the series. By clicking on these new options, you can go to an even more specific part of the collection. 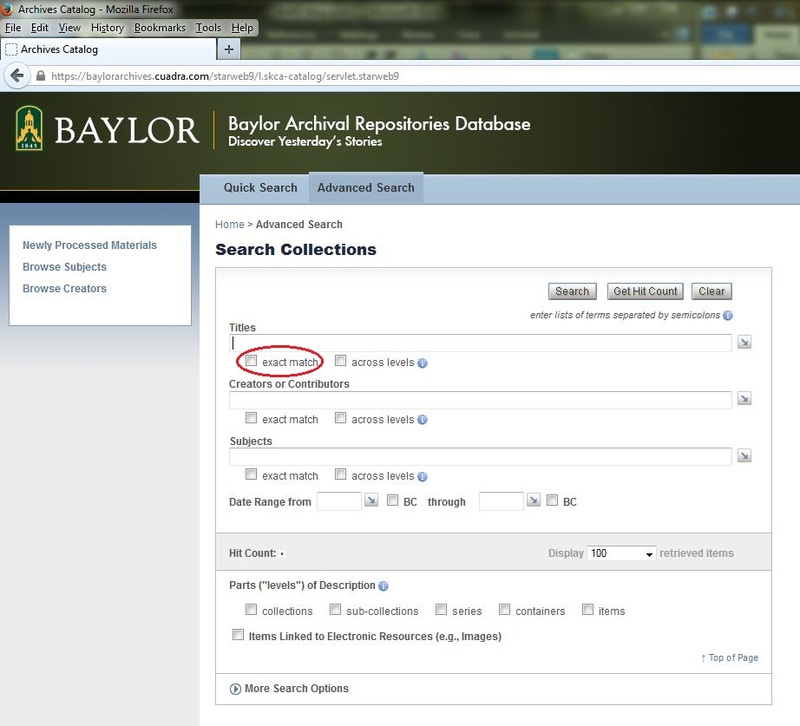 Another way to search for collections is to use the advanced search feature. You can easily access this feature by clicking “Advanced Search” in the blue bar at the top of the page. There are several handy things that can help in using this way to search. For titles, creators, and subjects, you can narrow the search by checking “exact match” so that the system is only searching using your exact words. You can also enter a term to search in the title, creator, or subject box, and then press “Enter” or click “Get Hit Count” in the upper-right corner. The hit count number tells you how many times your term appears across all collections. This can be handy if you are looking for something specific; it can tell you quickly how many potential places you might need to research (or if perhaps you should refine your search terms). Once you get here, you can peruse the thumbnail photographs as they are on the page, or you can expand them by clicking on a photo. Usually in this view you can see information about the photograph, what we call “metadata”—information giving you context for the item, which may be helpful for your research and citation. When you are done viewing finding aids in BARD, be sure to close down the system properly. In the main search page, in the upper right corner, click the red “Log Out” to exit from BARD. Leaving the system in this way is very important to ensure the proper functioning of the system. This concludes our series of how to navigate in BARD. If you have any questions as you are using it, please let us know! Love the Lady Bears? Ever wonder about the beginnings of women’s athletics at Baylor? Well, we have a book for you! We have many researchers visit The Texas Collection who are working on book projects, and we are always so excited when we hear one has been completed. Dr. Nancy Goodloe, emeritus professor of health education at Baylor, visited our collection several times while working on Before Brittney: A Legacy of Champions. 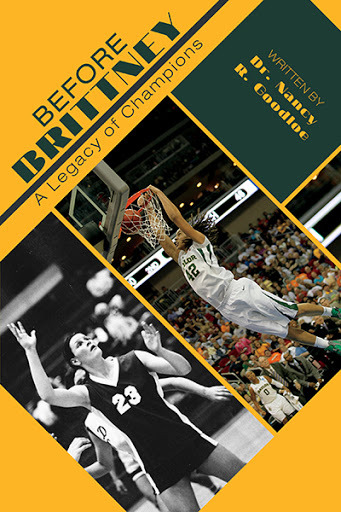 Her recently published book explores the path from the first female varsity letter winners in 1904—and then there were no more varsity letters awarded to women until 1976—to the national prominence Baylor women’s athletics enjoys today. Goodloe, a former Bearette, coach, and athletic trainer in the women’s programs (1965-76), places Baylor’s story in the national context of struggles for women’s intercollegiate athletics. At The Texas Collection, Goodloe drew on the Olga Fallen papers, presidential records, Lariats, Round-Ups, and our photograph files. She also interviewed various coaches, athletes, and other people who witnessed the development of women’s athletics at Baylor. The Baylor Bookstore is hosting a book signing event on March 22 from 10-11:30 am. Books will be available for purchase at the event. If you can’t make it but would like to order the book, it is available for purchase via the publisher’s website. Interested in hands-on exploration of women’s athletics at Baylor? Check out our blog post on the Olga Fallen papers and Flickr sets here, here, and here on women’s basketball, and there are some good tennis photos too. And then there are the athletics photos we’ve put on our Texas Collection photos page on Baylor’s digital collections site. But these online resources are just the tip of the iceberg, so come and do some research with us at The Texas Collection! In our last post on BARD, we learned how to get to the database, where the finding aids are to different collections, and how to navigate within the finding aid to find the materials you want to see. In this post, we will discover how subject terms work in BARD, how to print or make a PDF of your search results, as well as how to navigate to related web pages. You can enter the BARD system by clicking the link on our home page. Once in the system, you have several options for finding resources. 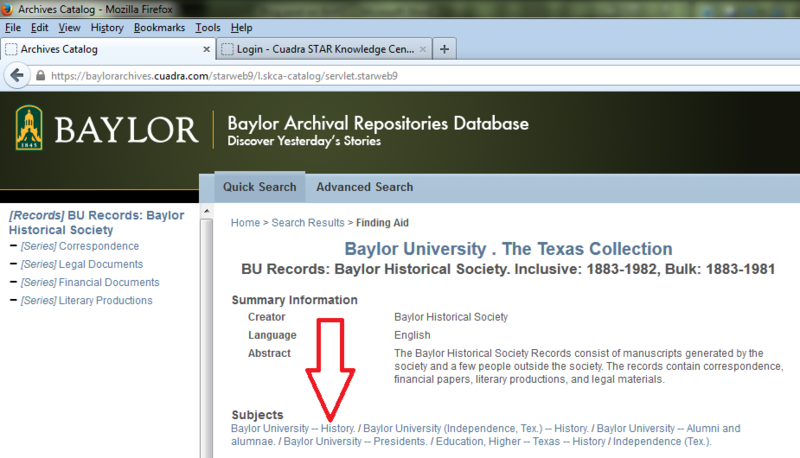 For this example, let’s say you want to see all the collections that have anything to do with Baylor University at Independence. 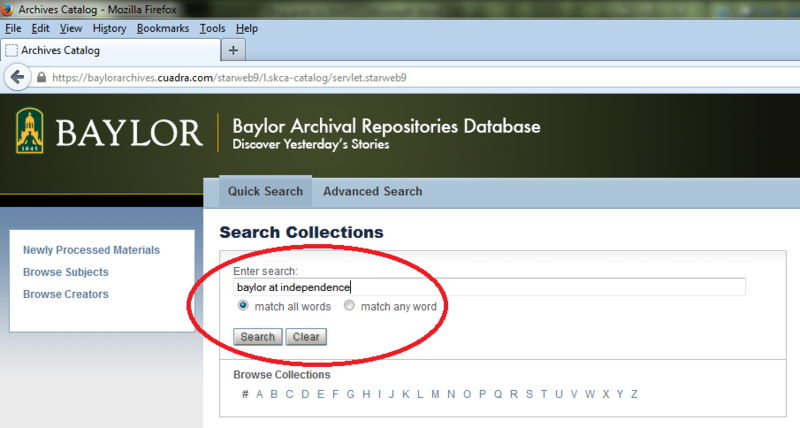 To look for this, you could enter the words “Baylor at Independence” in the search field in the center of the screen. When I did this search, 55 results came up! 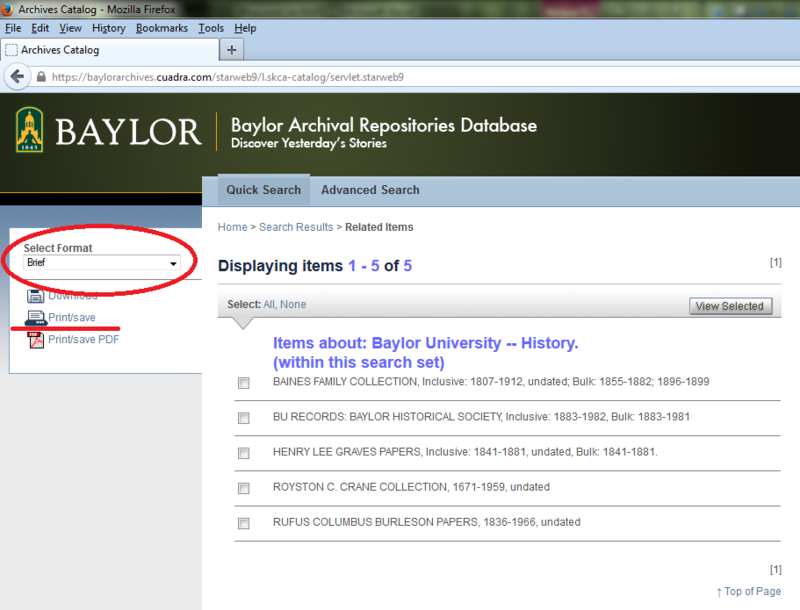 Click “Display Finding Aid” under each entry to view further information about each collection. Since we have thousands of collections in the database, you may wish to narrow your search by using the subject terms under the “Top Subject Clusters” on the left side of the page. …and this page will come up. Displayed are the five collections that have to do with Baylor University at Independence and also have something to do with Baylor presidents during that time. Let’s say that you have found some collections that you would like to examine at The Texas Collection. 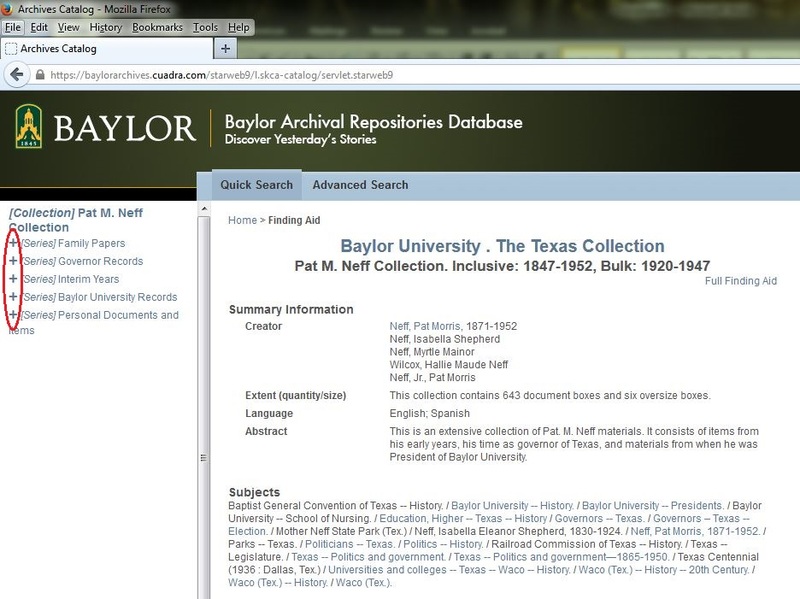 Since you are looking for something to do with Baylor University presidents at the time Baylor was at Independence, you probably want to see all five collections listed here, but you may not have time right now to peruse all the finding aids. Rather than writing down all five collections, you can print or save this list. Click on the “Brief” view under “Select format” on the left, and then click “Print/save” to open a window to print, or Print/save PDF to open a file to save. By opening this view, you can then print using your browser’s print function, or save a PDF file to your flash drive. Now you can remember which specific finding aids to look at later and figure out which boxes you’ll need to use, which will help you set your research appointment with our staff. From within this window, go down to all the terms in blue under “Subjects.” These are all keywords that you can use to find similar collections within The Texas Collection. 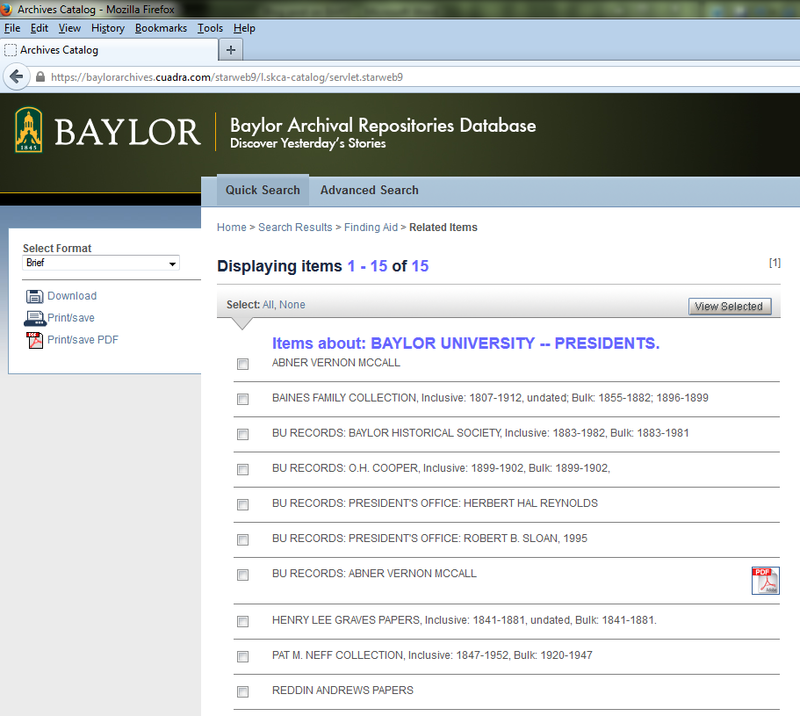 For example, you can click “Baylor University – Presidents” to see all the collections that we have indexed with that term. This way of moving across connected collections can be very valuable, since many of our collections are connected to other collections. 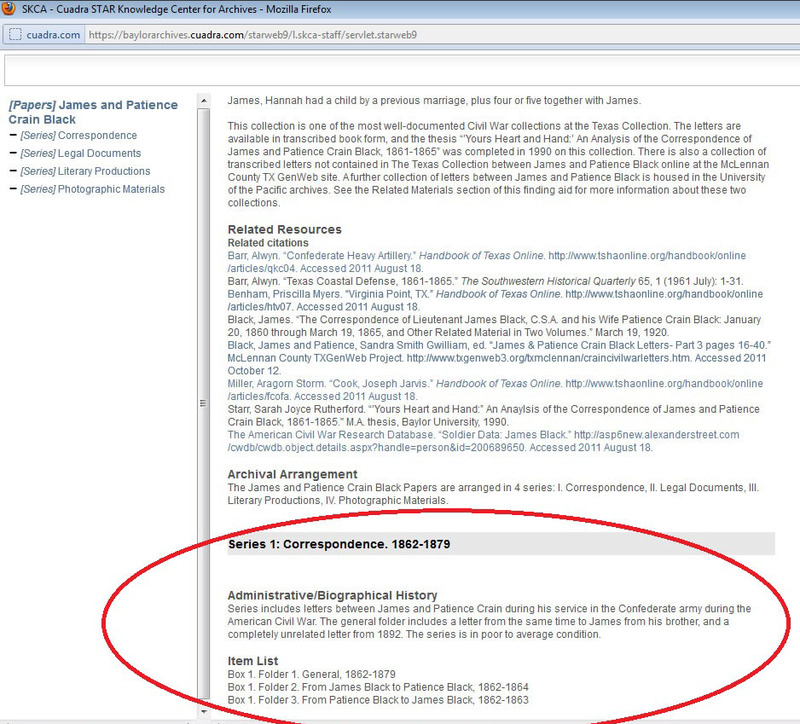 You can also see resources consulted for the finding aids that you see in BARD. 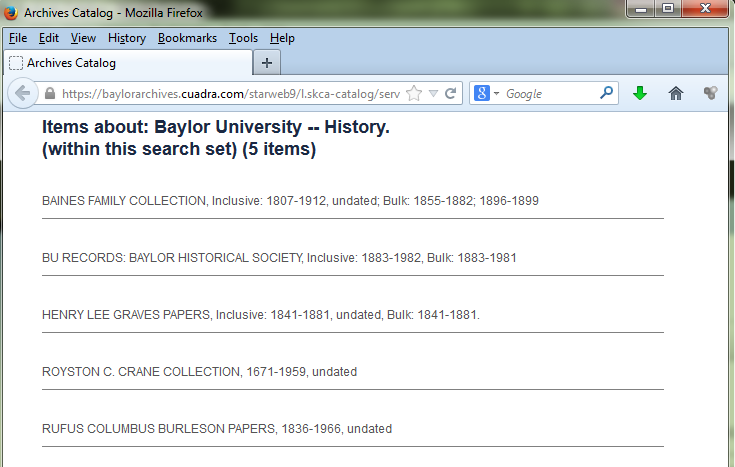 For example, let’s say you were reading along in the BU Records: Baylor at Independence finding aid. When you get down to the “Related Resources” part of the finding aid, there is a list of resources consulted for this finding aid. Many of these are in blue to indicate a hyperlink and can be clicked to take you directly to that resource or a catalog listing to tell you how to find it. If you clicked on “Murray, Lois Smith. Baylor at Independence. 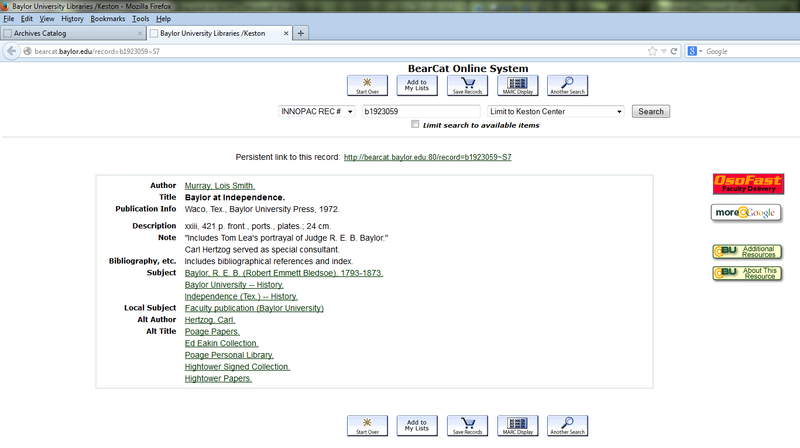 Waco, Texas: Baylor University Press, 1972” the link would take you to that resource in BearCat, our library catalog. You would then have all the information you would need to request that book the next time you come to The Texas Collection. When you are done viewing finding aids in BARD, be sure to close down the system properly. In the main search page, on the upper right corner, click the red “Log Out” to exit from BARD. Leaving the system in this way is very important to ensure the proper functioning of the system. Stay tuned for one more entry with helpful hints about using BARD! 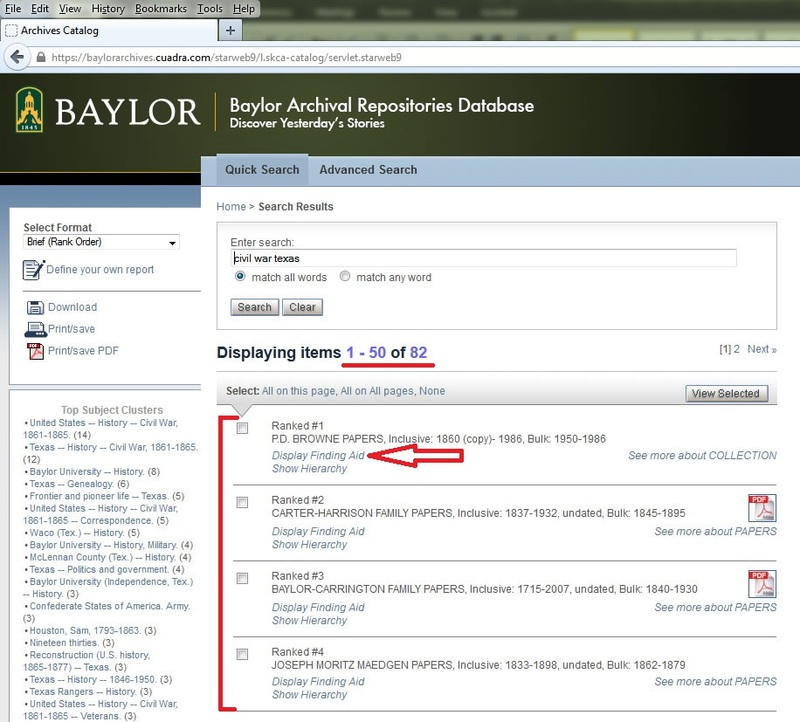 In November 2013, the Baylor University Libraries officially opened BARD (Baylor Archival Repositories Database). This is the second post in an ongoing series to celebrate the opening of this digital research database, and show some of the new ways to find resources. 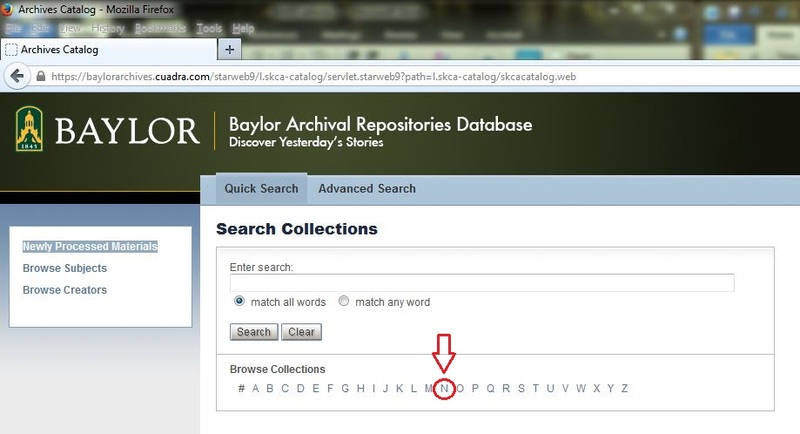 The Texas Collection is happy to open our newest discovery tool, the Baylor Archival Repositories Database (BARD), to our researchers. We believe this system will enable you to find more archival materials from The Texas Collection than ever before! You can discover finding aids to our archival collections by browsing or searching in BARD. 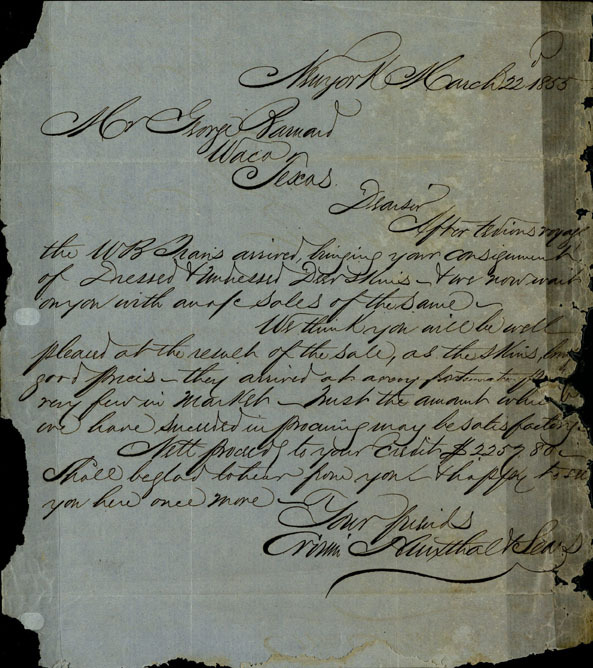 Finding aids are documents that describe groups of archival materials. 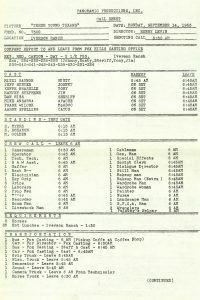 Finding aids that you will see in the system have an administrative note describing the historical context of the collection, scope and content notes that describe what is in the collection, and container lists that show the materials in each folder and box. Once in the system, you have several options for finding resources. For example, let’s say you want to see all the collections that have anything to do with Texas in the American Civil War. 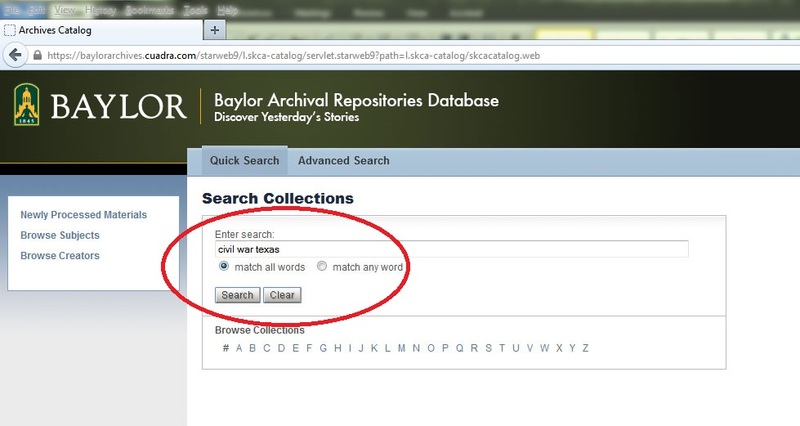 To look for this, you could enter the words “Civil War Texas” in the search field. Now click “Search.” When I did this search, 82 results came up! Since we have thousands of collections in the database, you may wish to narrow your search using more precise search terms if you receive that many results. 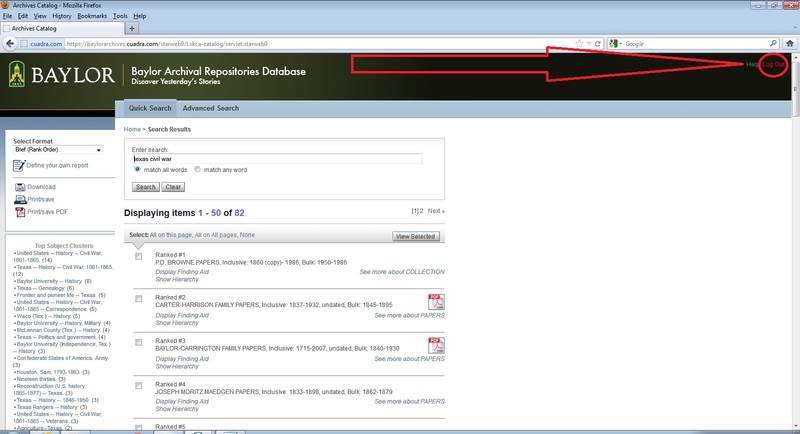 Click “Display Finding Aid” under each entry to view further information about each collection. We will talk about other things on this page, such as the “Top Subject Clusters” on the left, and the “Advanced Search” tab at the top, in a later post. The window open now describes the James and Patience Crain Black papers. Within this window, you can explore all kinds of information to help you decide whether the resources in this collection would be useful in your research. If you want to see the list of materials in the collection, you can click in the list on the left to jump to a specific group of materials. Most of our collections are organized in groups called series, which are basic groups of materials organized by the function in which they were used. For example, in the James and Patience Crain Black papers, if you wanted to know what letters were in the collection, you could click on “Correspondence,” and the list that came up would be the indicated correspondence. These particular letters are organized in three folders by year, and are in box 1 of the collection. 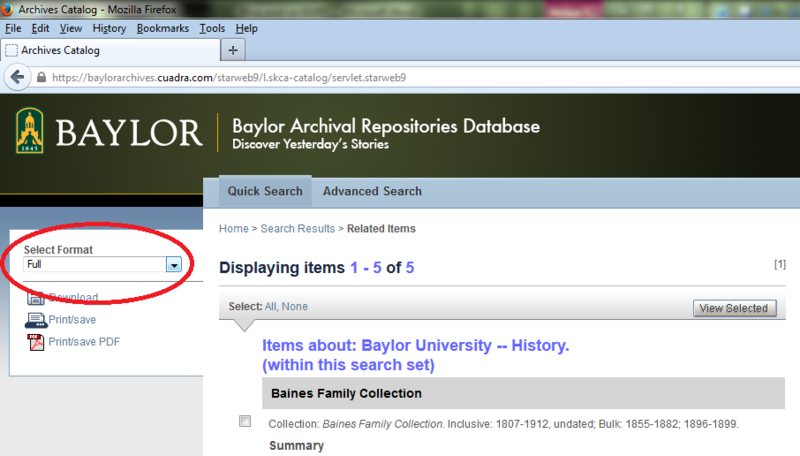 If you would like to set an appointment to view the actual materials in the collection, click on “Baylor University. 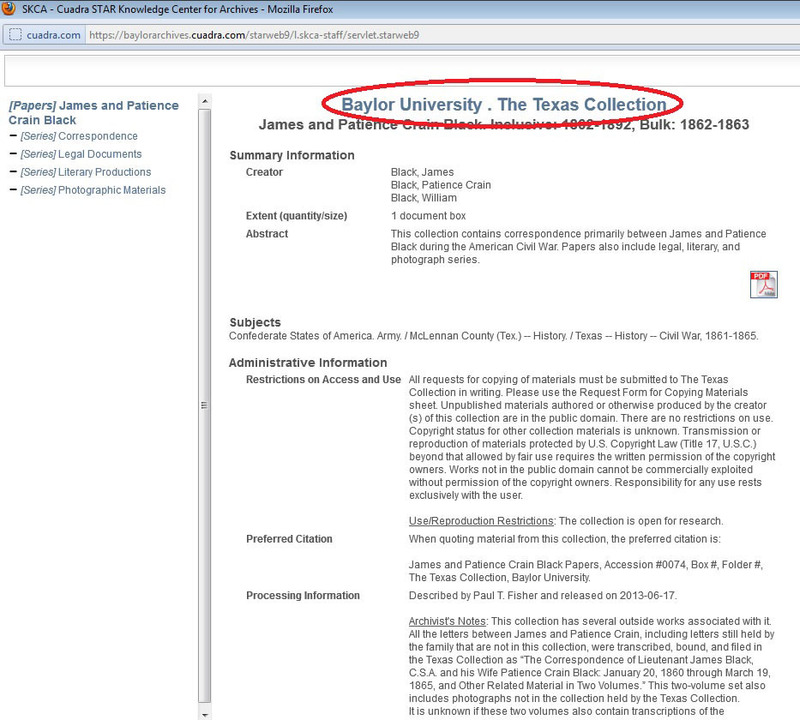 The Texas Collection” at the top of the page to view our contact information (the text circled in the screenshot below). You’ll need to provide the name of the collection and the box numbers so we know what to pull for you. We plan to discuss other helpful ways to use this exciting new system in future blog posts. 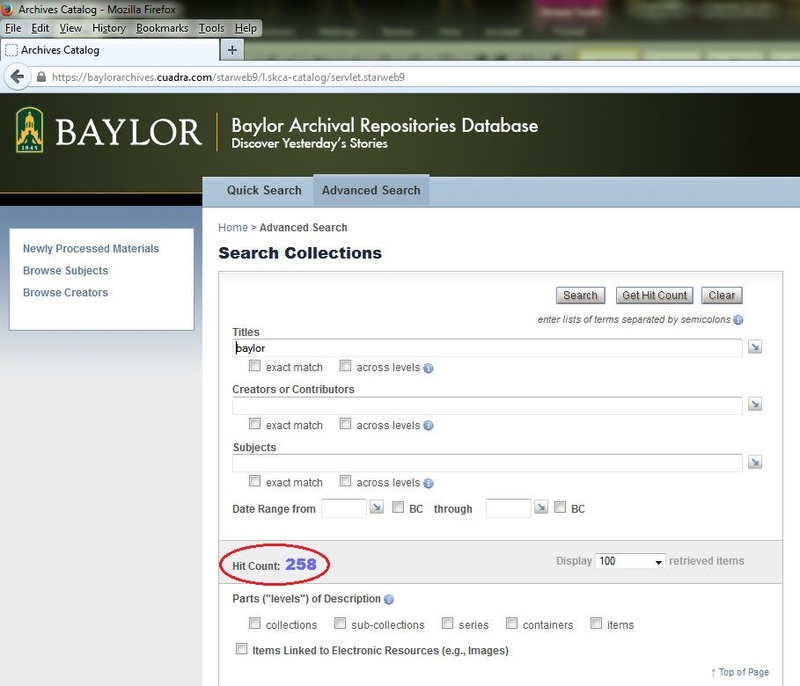 Stay tuned for more news and helpful hints about the new Baylor Archival Repositories Database! 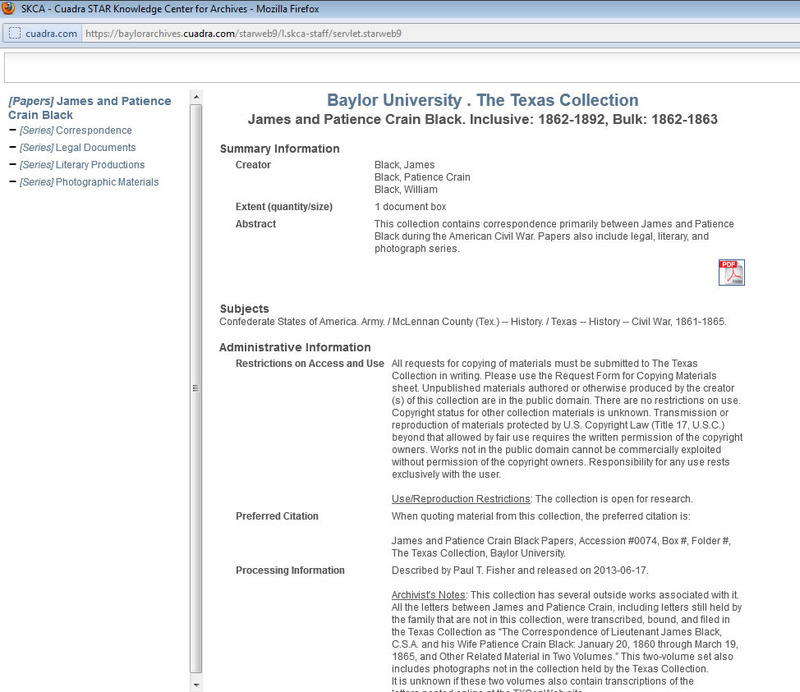 The Texas Collection is piloting the program, but Armstrong Browning Library and Poage Legislative Library also will be using BARD to share their finding aids. 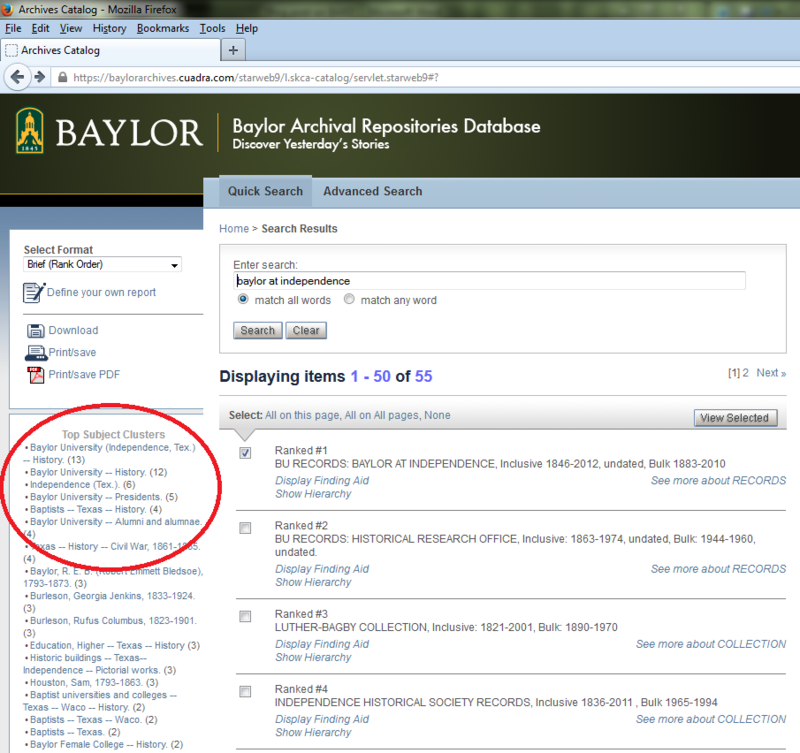 Look to those repositories soon to learn more about their efforts! The Homecoming parade is one of my favorite Baylor traditions, but I must confess that I never thought much about all the work that goes in to planning the event. Knowing who’s participating, assigning the order, getting everyone into position, encouraging marchers to, ahem, represent Baylor well…that’s a lot of work! These days the men and women of Baylor Chamber of Commerce organize the parade, but back when Homecoming and the parade were new traditions, it was faculty members who made the parade happen. One of these faculty members was Francis Guittard, a history professor who had been teaching at Baylor since the early 1900s. 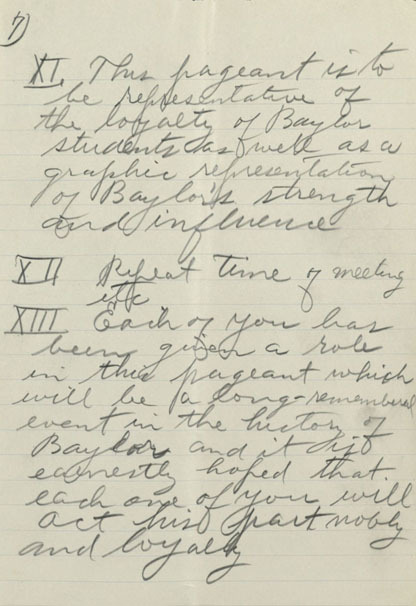 Frank helped organize Baylor’s first Homecoming in 1909, and President Samuel Palmer Brooks called on him again to serve as one of the marshals for the second Homecoming in 1915. Almost 100 years later, Charles Guittard (BU ’64) was doing research this spring at The Texas Collection for a book he plans to write about his grandfather. 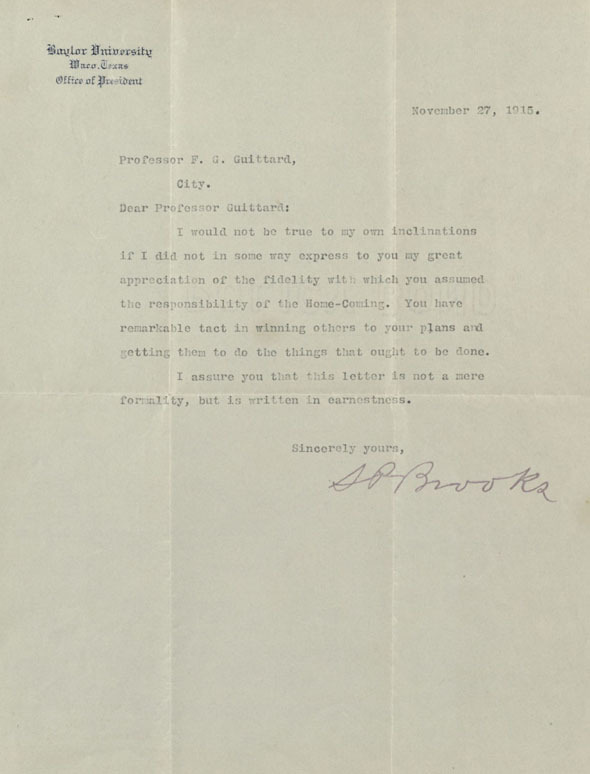 In the Francis Gevrier Guittard papers, Charles came across Frank’s notes for his comments to the 1915 parade participants. With the 2013 Homecoming parade coming up tomorrow, we thought this was the perfect time to look back at one of Baylor’s first parades. Wonder how Professor Evans talked students into being part of his Human Calliope–perhaps extra credit? Image scanned from the Baylor Bulletin on Homecoming 1915. Wait, need some explanation of that last bit? First, a calliope is a musical instrument that produces (very loud) sound by sending steam or compressed air through large whistles. Apparently Evans, a piano professor, had concocted his own version (see photo to the right), consisting of Evans pounding a cookstove as the keyboard and various Baylor men serving as the whistles, “tooting of some popular airs which brought repeated applause,” according to the December 2, 1915 Lariat. The parade progressed from Austin Avenue to 4th Street, then to Franklin and on to 5th Street, which took them to Carroll Field for the Homecoming game. 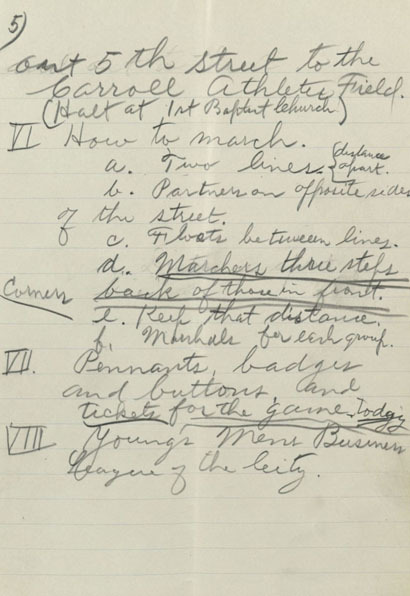 Guittard heavily underlined in his notes “marchers three steps back of those in front”—perhaps marchers walking too close or too far from each other had been an issue in the 1909 parade. Students were encouraged to enlist all present members of the organization to participate in the parade, as well as alumni—as long as those alumni were “not too fat and wheezy and full of rheumatics.” Evidently Guittard had no time for potential stragglers! Despite Guittard’s close attention to detail, he also took the long view—he reminded students that pictures would be taken that could be enjoyed for years to come. And indeed, The Texas Collection sees researchers coming every year just to see photos of early Homecomings. Check out our latest Flickr set, a slideshow of Kodachrome slides from the 1953 Homecoming parade. Kenna Lang Archer, a veteran researcher at The Texas Collection, is our guest blogger for this series, “A User’s Guide to The Texas Collection.” Drawing on her research on the Brazos River, Dr. Archer offered advice on identifying resources (including staff) in her first post; in her second, she addressed challenging resources. In this final installment, she offers her tips on determining when the research is DONE. I looked through hundreds of postcards in my research on the Brazos, and while I enjoyed that glimpse into the past, I needed only to expand on a single idea (whose citation already included more than 100 sources!). Not the best use of my time. From the Texas Collection postcard collection. For the final post in this series, I’d like to address a question that is as challenging as it is important…when is enough, enough? When is it time to step away—trusting that you have read enough letters, seen sufficient photographs, and pored through the right amount of memoirs, and how do you know that you’ve reached that point? It’s entirely possible that I am the last person that should be offering advice on the subject. My friends and colleagues have often chided me for “excessive” research, as have several editors (apparently, one really can cite too many sources in too many footnotes). However, my occasional inability to know that I have gathered the necessary citations means I am actually well placed to offer guidance. I tracked down this promotional mail-out after realizing that my discussion on agriculture in nineteenth century Texas was weak; I moved forward with my research knowing that I hadn’t found all that I needed in regard to a particular topic, and it was time well spent. From the Texas Cotton Palace records, box 2, folder 8. So how do you know when enough is truly enough? Where do you draw the mythical line in the sand? Personally, I use a series of hypothetical scenarios to weigh what I might find in future research against what I know from my current research. Would my ideas still hold if, somewhere, a source existed that said X; if I later found a source that said Y, would I still feel comfortable with my project? If I decide that nothing short of indisputable evidence refuting my argument would cause me doubt, then I leave my research be. If I feel like there is more than one way in which my ideas could be threatened or if I see a glaring omission, then I continue to research until I feel comfortable in my analysis. Hand-written documents can introduce still more challenges. Although I could read this letter in person, I struggled to read the Xerox copy that I requested and so, ultimately, went back to the materials a second time for a scanned copy. From the Barnard-Lane papers, box 3, folder 13. Copying/photographing every source you find is as risky and ineffective as copying no sources at all: to be buried by too much material is a cruel fate. Trying to track down a citation after the fact is maddening and a waste of precious time: write down every citation legibly and in the same place as the note itself as you go along. When making copies, do not assume either that the archivists will write down the citation for you or that they will include everything you need for reference: be responsible for assuring the validity and the location of your sources. Trusting too much in technology will eventually lead to a headache: be prepared to take notes the old fashioned way and keep a list of the sources that you have duplicated (as well as their location). I made a number of “rookie mistakes” when I began working in the archives; I can even admit that I fell into the same blunders several times. Fortunately for my self-worth (and unfortunately for the rest of the research community), I am not alone in my struggles. I would guess that every researcher has, at one time or another, struggled with the effectiveness of his/her research methods or the decision to walk away from new sources. It’s a learning process, and one that everybody must endure. However, it can be made easier. My hope for anybody reading this series is that his or her experience in primary source research might be a smidge less chaotic, a bit more constructive, as a result of my suggestions. Onward, archival soldiers…and until next time, good luck! Missed the first installments? Check them out here. Archer is an instructor in the history department at Angelo State University. She earned her bachelor’s and master’s degrees at Baylor and then her doctorate at Texas Tech University. You can learn more about her research on her website, www. kennalangarcher.com. 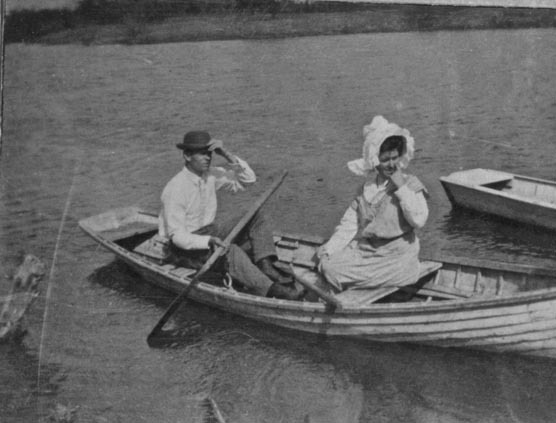 Photograph of a baptism in the Brazos River: images like this are astoundingly rare…and so are sources that so clearly “make” a portion of your research! Kenna Lang Archer, a veteran researcher at The Texas Collection, is our guest blogger for this series, “A User’s Guide to The Texas Collection.” Drawing on her research on the Brazos River, Dr. Archer offered advice on identifying helpful (but not obvious) resources and making use of special collections staffers in her last post. In this installment, she discusses some of the perils of primary resource research: sources that contradict your thesis and the challenges of assessing authenticity in materials. Unfortunately, archival research does not always yield information that one might call “helpful.” To research in archives is to invite uncertainty into your academic life. Yes, I have located sources that pulled everything together, but I have also found sources that contradicted all I expected to find. What is the proper response to a source that seemingly undermines your work? There is no one answer, but my advice would be to remember that there is promise in confusion. Roughly halfway through my dissertation research, I found a source that seemed to weaken my argument in a serious way. It was nothing short of an intellectual catastrophe. I erupted in genuine (if, thankfully, short-lived) tears and stopped work early that day. That evening, I wrote up a brief outline for my project and began to ask difficult questions about the new material—what did it really say, how might it broaden my study, did it undercut the entirety of my thesis or portions of it, could I simply fine-tune my ideas? It took me awhile to incorporate these answers into my outline and then to adjust my writing, but as I struggled through the muddle that once was my project, it became easier to envision the ways in which new ideas could fit together. The end result: a stronger project! Unfortunately, there have also been times when I couldn’t work out the contradictions that resulted from new information—I’ve discarded projects and entirely reworked projects. Whatever the ultimate outcome, “defiant” sources are beneficial—they help to refine research projects into something both more intriguing and authentic. Though I knew something about this photograph (it came from a Baylor student scrapbook), I didn’t have a location. Was this the Brazos River? I sure wanted it to be, but ultimately I had no clear evidence one way or another and so I set aside this image as a source. That being said, whether or not sources prove to be helpful, researchers must take the time to assess their authenticity. Letters, books, pamphlets—they’ve all been written by individuals with preconceptions and opinions. Photographs and paintings can be staged or emotionally skewed as well. In other words, every source is created in a context that shapes its meaning and its value. Was a tract written to attract visitors to Texas? It probably emphasized the good and downplayed the bad about life in this state. Was a letter written in 1917? Ongoing war in Europe surely colored the text, and the contextual biases might have shifted from one month to the next. It is imperative that researchers understand these nuances. So how do you account for the possibility of hyperbole, the use of incorrect figures, the fever of patriotism? When working with a primary source, I try to anticipate what biases might exist by considering the who, what, where, when, and why of its creation. For example, I might ask where this information originated and whether it was corroborated only by people from the same family or city. If possible, I also account for subjectivity by increasing the number of sources that I review and, thereby, increasing the validity of statistics, stories, and so forth. 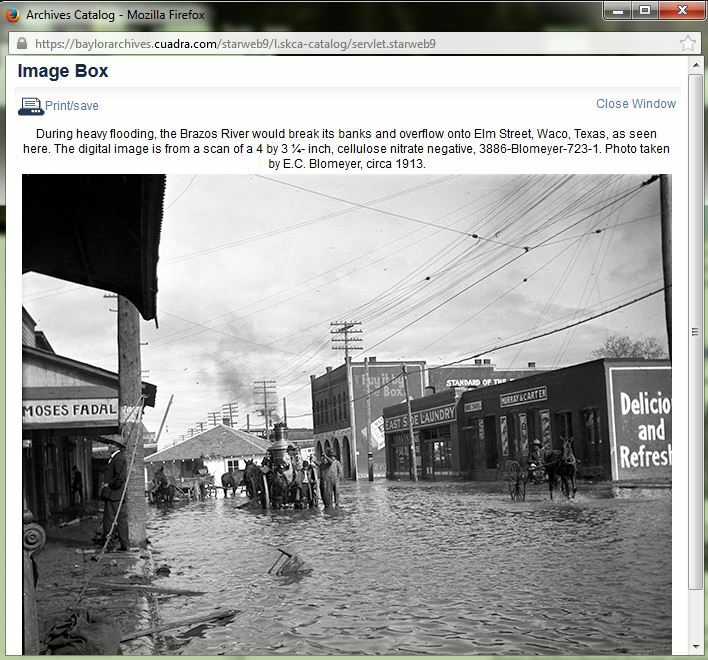 The Brazos River flooding, circa 1913: In some cases, it is possible to determine information for sources that is not explicitly given. 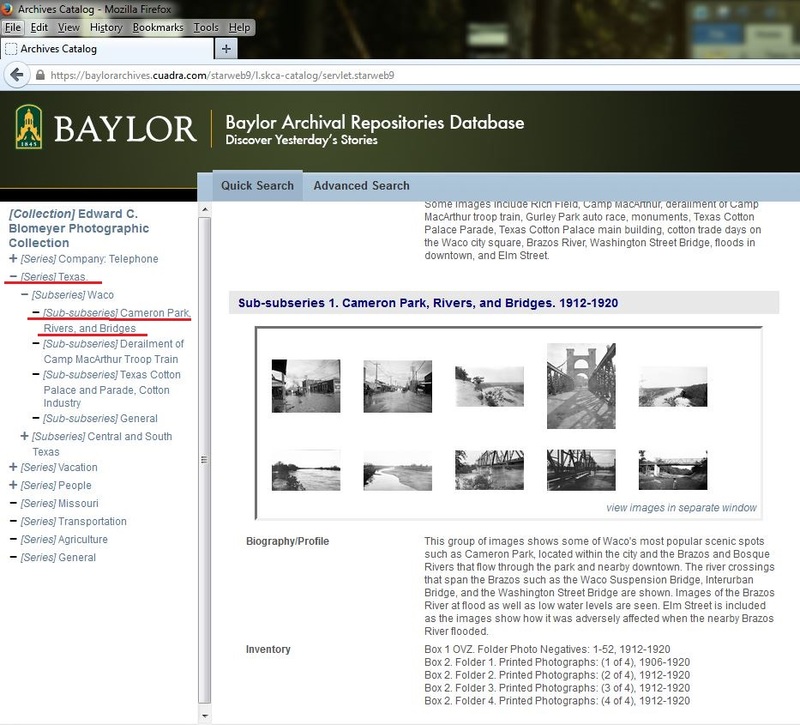 For example, I can reasonably date this undated photograph by comparing the years of Brazos floods with the construction dates of Brazos River bridges, the advent of technology, and popular styles of dress. Whether you have one crucial source or twenty adequate sources, take the time to judge the authenticity of your information…and, most difficult of all, have the courage to set aside a source, however valuable, whose information cannot be trusted. It is far more important to work in confidence knowing that you have prioritized accuracy than to squeeze a questionable source into an existing argument. Stay tuned for the September entry (and final post) in this series.